It's been quite some time since I've given an update on Pathfinder Adventures and for that, I am deeply sorry. In that time, the team has had some changes in both priorities and members. In the end, though, we have continued to work on making Pathfinder Adventures more accessible to existing users and to hopefully expose a new group of gamers to the world of Golarion and the iconic characters that travel within. Some of you might be saying, "Hey, why did we have to wait so long for a patch?" and, "Why didn't you update us more often?" We wanted to give the players the best PC experience with Pathfinder Adventures. To keep this from being considered just a mobile port was an enormous amount of work and required us to focus a majority of energy and attention for it to become a reality. It's not a super awesome answer but it is the truth. I think when I have burned my last bridge and finished writing my book (I was thinking of calling it Production: How The Sausage Is Made And Other Stuff And Things With Lots Of Capital Letters But No Commas) I will be able to explain the twists and turns the last few months have had. The one constant that remains is the dedication the team has for the project and making awesomeness. 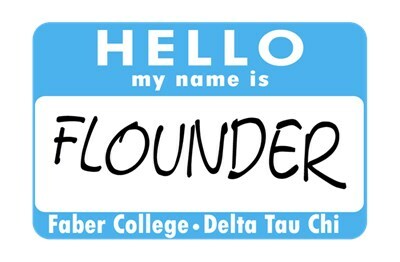 "Flounder, enough! We only want to know two things: What's in patch 1.2.6 and how did you get your cool name?" The interface has been PC-ified. This was no small feat. If we had released a straight port of the mobile version we would have been flambéed. The team added hotkeys, scrollbars, and scroll wheel support that folks will be able to pick up on GoG, Steam, and the Mac Store. The pricing for the PC/Mac versions will initially differ from the mobile versions because we don't use in-game purchases, rather there is the availability of DLC for some elements, but when you buy the base version of the game you get the entire Rise of the Runelords content. For reference, the base version of the game will have all the decks and cards that are in the original Rise of the Runelords bundle, plus all the Uncommon and Rare Treasure cards. Two DLC packages will be available; one with all the iconic Alts and some legendary dice and the other with the rare epic and legendary Treasure Cards and some legendary dice. The Obsidian Edition comes with the base version, the two DLC packages, three promo cards (two of which are Edér and Pallegina from Pillars of Eternity, yeah! ), three legendary items, a bunch of runes/charms/gold, and a DLC pack that will be available in the near future. We plan on keeping future content parity between all platforms so that if there is something that is available on the PC, the Mac, and mobile users will have it at the same time. All platforms can use a single PlayFab account which means that all content and progression can be shared between them. It used to be kind rough if a user spent a lot of time on one platform and when they got another they would have to start from scratch or contact support. It was doubly rough if they actually had a lot of content unlocked on each platform. We say, no more! One account, all platforms! We also tackled some of the interfaces that we thought were problems including the Party Creation and Character Selection screen. These changes will be reflected in all platforms and be a more streamlined process that, while functional, wasn't making a very good impression on newer users and tolerated by current players. In our faithfulness to the original card game we had the exact same valid deck check in the digital version. To expand the content in the digital version we added Treasure Cards (these can be ignored in Story Mode for those that want the exact same card game experience) but unlike most card games, when you open a Treasure Chest you don't actually get a copy of that Treasure Card for immediate use instead you just get the chance to find it in your adventures. It's kind of a hard concept to grasp unless you are familiar with the system and we have gotten a ton of feedback from the player who weren't. This addition will hopefully make it more gratifying when opening treasure chests and allow some players to hold on to some of those more specialized cards. Aside from copies of the Treasures Cards going into the ether to be found a copy is sent to the Stash for immediate use. This also helps alleviate the need for Mule characters that are solely created to store some of the less desirable cards for their current game progression. Plus, it is a bit more intuitive for the digital-verse. The Stash is set at 10 slots right now and includes an Unclaimed tab. All cards in Unclaimed cannot be used by any characters until they are officially moved to the Stash. You can open up a hundred chests and all the new cards will be waiting to be moved into the Stash. If you happen to go over your Stash limit you will then meet a happy vendor who will readily give you gold for your unwanted cards. Ever have that roll you really, really needed to win or your permadeath character bites it or you are a turn or two away from kicking Ghlorofaex to the curb? We might just have the charm you are looking for. 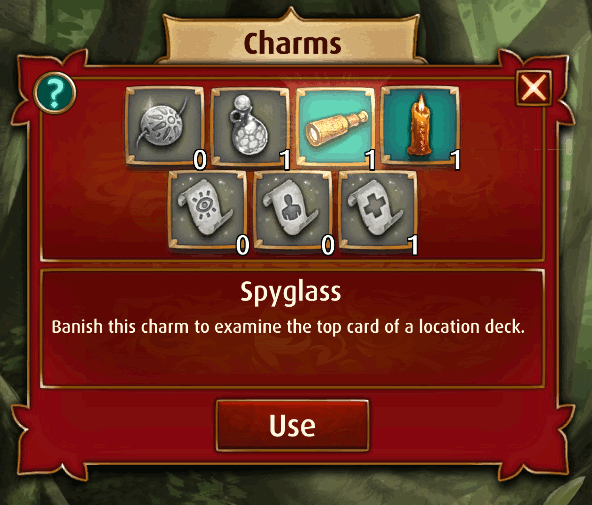 Charms are one-time use consumables that have an immediate effect on your current action. They vary from adding a bonus to a check to adding turns to the Blessings deck. They have a gold cost associated with their power so a bonus d4 to a roll might only cost 50 gold but adding to the Blessings would run you 500 gold. Runes differ from Charms in that they have a time limit associated with them and they almost act like a pseudo scenario power. The Rune of Wealth would double your gold acquisition while the Rune of Shielding would reduce damage by one for four hours. These will all be available in the Store and during game play for in-game gold only but Runes have to be set up prior to entering the scenario. You might not think this is a feature as much as just another iteration but the tutorial was a requirement to play the game and a good three-quarters of the people who were forced to play it were never seen playing our game again. No kidding. This super-RAD version of the tutorial is cut up into five bite-sized scenarios that teach very specific elements of the game in a clear and concise way. You even get special rewards for completing all of them. We don't consider just being able to play the beginning scenario a reward. Also, now with 100% more skipping. Yes, that's right, if you don't want to play the tutorial or are already familiar with the game, we have a skip button that is just right for you. Yeah, you see that? Your chance of winning the check. 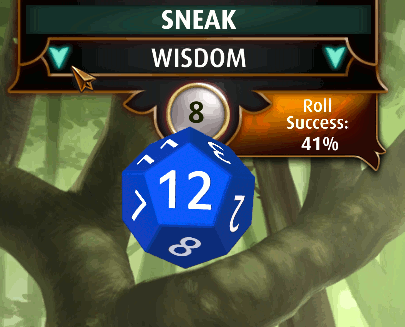 I've confidently failed some 97% chance of success rolls but now I don't confidently go into the roll with a 20% chance glaring at me. It's a minor feature but it honestly makes your decisions a little more clear and that one additional d4 that Lini can throw in there is actually a huge improvement. 1.1.6.5 - Sorry, that just didn't happen like we planned. It was supposed to do two things for us: Remove quest mode and grant people their rewards for checking it out as well as offer some additional Goblin alts to use all that ph4t cash on. The Goblins are coming but we will include their availability when we do some content specifically for them. That announcement will be coming soon, I am sure. Lots and lots of them have been fixed. Like a multi-page post that isn't part of this blog type of amount. We seriously want to make the experience better for the players and invested a lot time to fix issues that were brought up. I want to thank everyone that was involved with the actual creation of the content I just wrote about as well as you, the reader, for taking the time to read about our upcoming release. Patch notes will be coming shortly. Those will likely be boring and not nearly as cool as this post or my name. 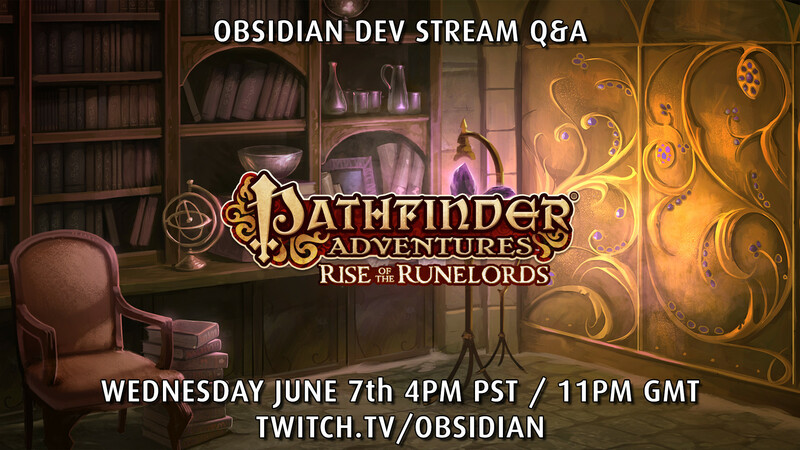 We also have a Dev Q&A tomorrow at 4PM PST on twitch.tv with yours truly! So don't miss it and post your questions here on the forums so we can can answer them on stream! Oh fiddly-dee, look at the time. Gotta go! So if you buy the game on pc you get all the content on mobile too, but those of us who already bought the Rise of the runelords bundle must buy everything again to play on pc? Am I understanding this correctly? 1. I purchase Pathfinder Adventures Obsidian Edition on Steam. 2. I open Pathfinder Adventures on Steam and all the content I expect is available. 4. 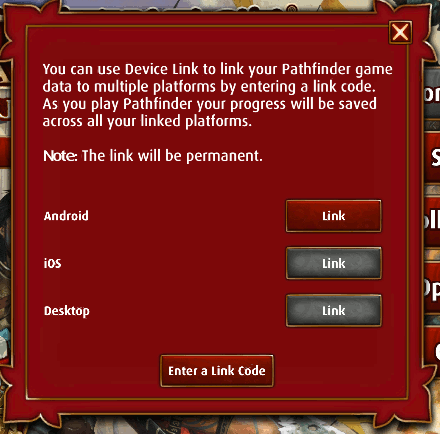 I then link my Steam Pathfinder Adventures to my mobile Pathfinder Adventures. 5. My Steam and mobile accounts successfully link. 6. All the content is now available on both Steam and mobile Pathfinder Adventures for me to enjoy. 7. If I had multiple copies of treasure cards, they are now available on Steam Pathfinder Adventures for me as well as the gold that I had accumulated and any dice I had unlocked. 10. All the content that was previously available to me is there as I expect it to be as well as any Promos, Uncommon, Rare, Epic and Legendary treasure cards that I did not have a copy of and some Legendary dice. Those puffed up tutorials is a good new indeed to new players. Most of the rest... well They Are familiar from other apps. But seems to be good update! So we can pay for a premium game and still get freemium cheater crap? Wow, that's just great. I hope with the new content, - or even with existing content - that there will be some kind of significant difficulty increase to come. As of now, with treasure card-based boons thrown in by default, combined with these one-use rune bonuses, I worry that players may find the game difficulty trivial once they have a vague grasp of the mechanics. I didn't find the Rise of the Runelords adventure path difficult to start with as-is, so I really don't particularly see the need here. Day one all-in purchaser here and man, this app is going more and more in a direction i would not want it to. Best of luck, but I'm probably out with this one. I just wanted the board game in app form, and instead we are getting p2w mechanics, more p2w mechanics layered on unneeded freemium mechanics, and ultimately everything but what is actually needed - content. Literally 20+ extra classes, 3 other sets, or the custom made content to choose from and you decide on a stash and charms/runes. This update is better than playing as a Ranger, Alchemist, Bard, Inquisitor or any of the other variations of unique classes that exist. Maybe one day you will get there, but it's been over a year and I don't see much light at the end of the tunnel for myself and my relationship with this game. All the best either way. I stress over and over again that my feedback is from a perspective that I want you guys to succeed mixed with my own personal preferences. ultimately everything but what is actually needed - content. Literally 20+ extra classes, 3 other sets, or the custom made content to choose from ... a Ranger, Alchemist, Bard, Inquisitor or any of the other variations of unique classes that exist. Obsidian, I want to second this point. Content would get you more paying users who care. P2W freemium shiny things might attract whales, and I understand one big whale means​ more payroll despite undercutting the overall game quality. But that hurts the community too, no? a) I like Quest mode and am astounded you are removing it AFTER developing it and making it stable. I prefer it to story mode and primarily play it. So of course you will delete that. ??? b) You made content unlocking by gameplay possible, and offered an (apparent) "just pay for all content" option -- but that didn't​ unlock all content! From my POV, unlocking only my desired characters and occasionally getting a few chests w/winnings makes much more sense than buying the whole game for $25. Why? Bc the mobile game market price point is generally $3-$5 w/IAPS of $1-$3. Your price point made your game unwanted to many players (even now) and disappointing to those who spent $25. You could still fix this, somehow. c) Somewhere in here, one could imagine exists the pure card game version. But now w/runes/charms you are corrupting that. I think its a mistake. d) Playing this game (still one of my favs) is agreeing to follow limited options constantly. The UI makes me feel limited, not empowered. Having a glow on next move options is a great idea -- making it too dim AND not show all the options available is a UI mistake. The awkward build party screen, the locked phases, the painful progression in levels, the inability to rename characters or change pictures or scribble on a card, the inability to flag hated cards as crap, the difficulty moving cards to the correct gameboard locations, the bizarre new costumed classes IAPs -- these were all choices made which IMO hurt the game in different ways. e) I still play this game and still like it, despite all the challenges. Because underneath, the core concept of a card RPG where heroes progress between adventures, is awesome. I hope it gets immitated and improved upon. Last points -- I had great experiences with your support folks, who kept me happy despite the Daily Gold feature being all messed up. They made me stay loyal. The community helped me figure out this game better than the tutorial. Adding % chances doesn't improve the game IMO. Remember when Han Solo said, "Never tell me the odds!" The shiny overpriced dice, the only slightly better treasures, and the chance to encounter purchased items <-- these didn't make me want to pay or play or make me loyal. If your game had simply given 10gold every 3 hours reward for logging in, you would've kept average mobile players. Rewards keep people playing, not more stuff to buy in a storefront. IMO it's the abundant storefronts in modern games -- offering DLC (which is another way of saying 'You can't have the full game without us getting more of your $'), gameplay unbalancing single use items, or special hair/outfits for your avatars -- which kills modern games. Or hurts them a lot. Anyway, whatever you do with this game now, I will still try to play it. But gee, I would've much more happily paid actual money for real expansions rather than this new fluff. @Fade2Gray, e-mail support. They are reasonable people. I'm not saying it will definitely work, but you can give it a shot. The only thing to lose is digital ink and digital time. Hey, everyone. Brandon here. I'm a designer on Pathfinder Adventures. I just wanted to answer a few questions and give some clarification on points we have discussed over the past few days. I will likely post this in response to a few different threads so feel free to post this anywhere you think people might have these questions/comments. Thanks, everyone. "I've already spent a significant amount of money on your mobile version. Why do I have to repurchase the game on PC?" This is a good question and if I were in your shoes I'd ask the same thing. The PC version of the game is not using a free-to-play model for revenue generation. There are both business and technical reasons for this. This means folks that purchased content on the mobile version of the game will need to repurchase the content on Steam or GOG. That said, we are working on a way to hook up players who have purchased a lot of content for the mobile game. Things like free upgrades and coupons to lower the price. I don't have any specifics right now, but that info should be coming out soon. "If I merge my PC/Android/iOS accounts, does that mean I will see all of my unlocked/purchased content on all of these platforms?" Yup. For example, if you had some special promo cards on your iOS account and you merged it with the PC, they would show up on the PC build of your game - even if we don't have that content for purchase on the PC. It works in reverse too. If you purchased the Obsidian Edition on Steam and linked your accounts you would unlock the treasure cards on your mobile versions. "Why didn't you just make more content? All I wanted was more content." Two things: content is by far the most time consuming thing that the team works on AND the Pathfinder team is only a handful of people. We felt it was really important to put out a PC version of the game. It is probably the best way for us to expand our user base. We have had most of the team focused on creating this build for the past few months. Because the team is small, we can really only be focused on one thing at a time. This meant that content creation was getting pushed off a bit. While pushing off content creation isn't ideal, we felt it was the best for the long term health of the product. More people playing equals more money equals more content for the game. It sounds like a cold calculation, but it is the reality of the situation. Same goes for the Asmodee deal. Working with Asmodee expands the game's reach and gives us a better chance to create more content for the game. At this point, we have started making more content again. You guys know about the Goblin campaign we are working on, but we also have some other things we hope people will like. We'll be able to talk about it in the next few weeks, I think. "Why did you create Feature X? Nobody's asking for it and I don't think it adds anything to the game." Most of these new features were requests or designs from me. All of these features came out of a want to make the game more accessible to current and new users. In particular, I was focused on making the game easier to get into and more intuitive for people. I realize that some people think the game is way too easy, but the vast majority of new folks that play the game don't understand how it works right off the bat. You can only tutorialize so much before people stop paying attention so there is a fine line to walk. This is an important thing for the team to resolve. The board game version of the game has the benefit of knowing that the users will read through the entire instructions before they ever start their first game. This means that the first scenario can immediately start with very little ramp up. By necessity the digital game needs to be more user friendly. So, in that vein, we attempted to make UI and current features more intuitive - even if it diverged from the board game a bit. While I feel there are still things we can add to the game to help, I feel like we were successful. In other updates we will be adding in other features that the community has identified, so be on the lookout for that in the future. "Why did you add in consumables (Runes/Charms)?" First, they can really help new players get past a scenario or situation that they are having a difficult time with. I don't expect that players will be using these items for all instances, but it does allow them to get out of bad situations. This also applies to folks trying out harder difficulties. Second, this gives us something to allow PC users to purchase with gold. Originally, we were going to remove gold from the PC version, but these consumable items allow players to spend their earned gold on bonuses in the game. Lastly, this will also help out the mobile monetization. If people enjoy using these items they can purchase (or grind) additional gold to get more. It's important to note that players don't need to use any of these consumables. They are there for folks that need a little boost to complete some content or get out of a jam, but they are never required to complete the content. 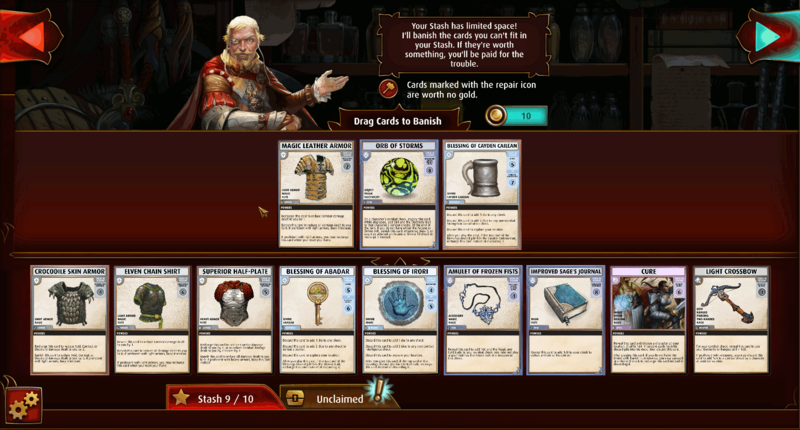 If you would prefer an experience closer to the card game, you can safely ignore those UI buttons and you should have the same experience that you are able to get right now. "Have you considered a difficulty increase for the current (or new) content?" It's unlikely that we would increase the difficult of current content, but we are exploring how to make the game more difficult in future content. I have some ideas and once we announce new content I can get into the specifics. "Why did you remove quest mode?" Unfortunately, with the size of our team, it was too difficult to keep quest mode running while also creating new content. The decision was to focus our team on creating new content instead of new quest mode content. We are also sad to see it go, but it is the right decision at this time. Removing quest mode should also resolve other bugs and issues that were being caused by it. These weren't insignificant and should make for a better experience. 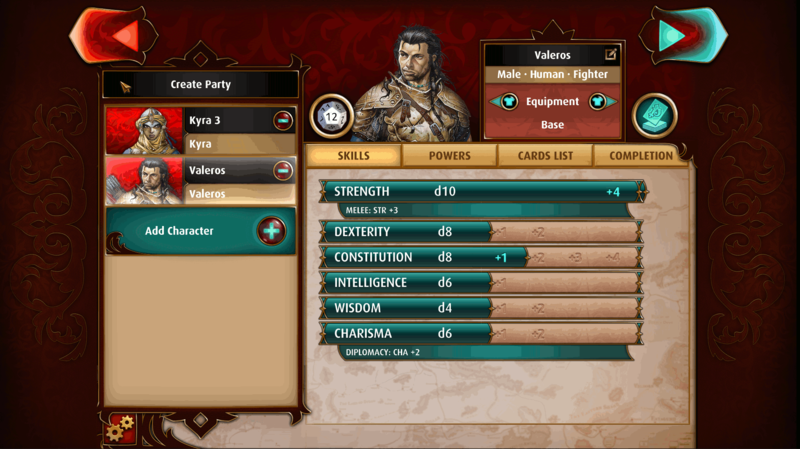 → Pathfinder Adventures Dev Blog Update and PC news!